In my current company (Jelastic) we have something happening to us all the time: latest blog posts, awards, media mentions, etc. We are doing a decent job pushing these to various social media, but I also wanted to get these to my contacts in Skype (Skype gives you the ability to set your status text in your profile). It takes the latest item from my blog and twitter feed, sees which of them is fresher, and (unless the tweet is just my reply to someone) pushes that to Skype (the property is called MoodText). Now if you want to have this happen automatically you can just schedule it using Windows Task Scheduler. Either sign your script or set ExecutionPolicy to RemoteSigned – otherwise the script execution will fail. In case you missed the announcement from the PowerShell team at Microsoft, it is time to register for PowerShell Deep Dive 2012! PowerShell Deep Dive is the most advanced PowerShell conference of the year with level 400 sessions and all main PowerShell MVPs and movers and shakers, as well as the PowerShell team members attending and presenting. This year, it will be a full 3 day long conference with tons of great content and a lot of PowerShell v2 and v3 stuff – so don’t miss your chance and register today to get the early bird discount. Even more importantly, the call for session proposals is still open till February 15. So if you have a few cool topics to preset, want to share your knowledge, become a star, and get your conference pass, travel and registration paid for (!) send your session abstracts to TEC2012@quest.com ASAP. See videos from the Deep Dive 2011 here. 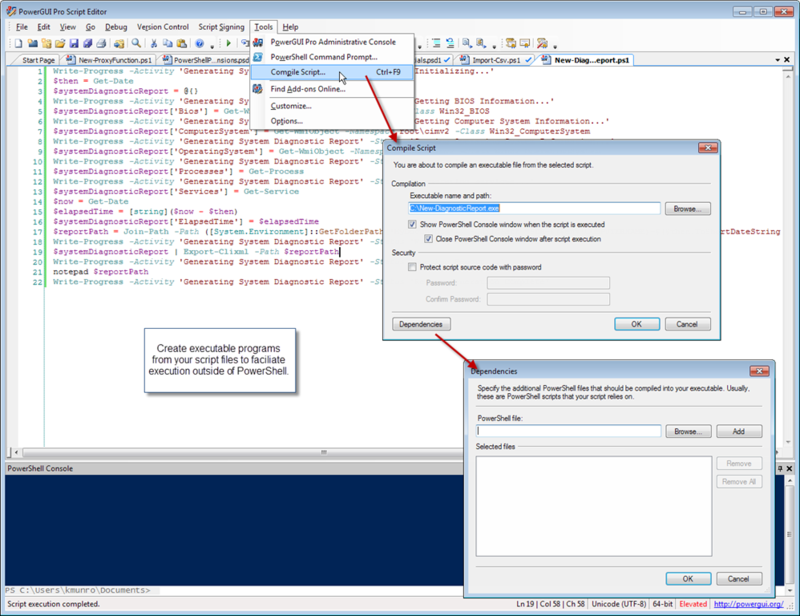 Here’s another neat feature we have added in PowerGUI 3.0 – ability to reset PowerShell runspace when you need to. Go to Debug menu, and click Reset Runspace. And that will give you a nice new shiny PowerShell session with no variables or other changes left from your preceding work! 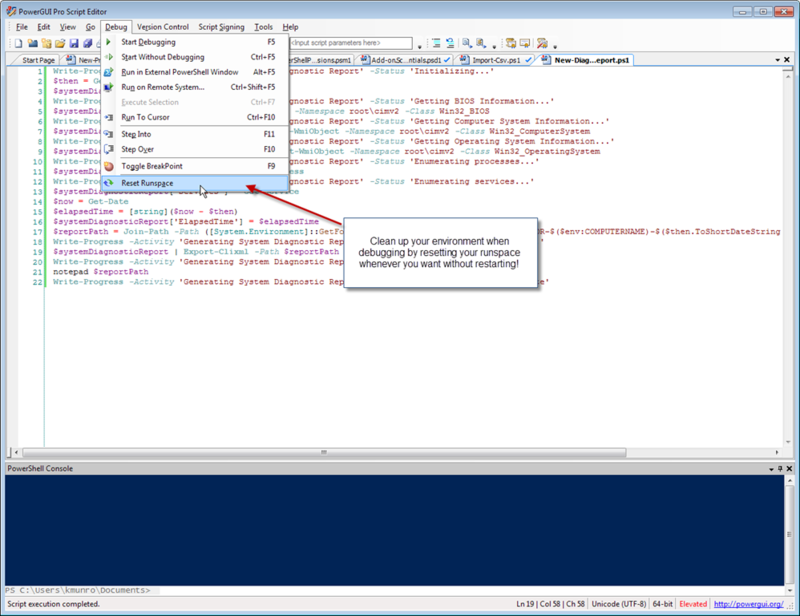 On Debug Options tab, select Reset PowerShell runspace each time debugging is started. I somehow prefer manual method to automated one because quite often there is value in left-over variables (you get intellisense for example! ), loaded modules, and so on. However, I can then manually reset the runspace before my final debug session to make sure the script works fine in a clean environment. Either way, now you have both options at your command! Happy scripting! This session was recorded live at The Experts Conference. PowerShell is a unique environment, combining features from shell, scripting and object-oriented programming languages. In this session recorded at The Experts Conference 2011 PowerShell Deep Dive, Bruce Payette explores some of the trade-offs and design decisions that were made in order to produce a workable system. This is a live recording from US TEC 2011 PowerShell Deep Dive conference. TEC Europe is just around the corner – October 17-19th, 2011 in Frankfurt. Register today to get a discount. 3. And obviously leave them a note in the Give us a killer quote about your winner! box. 4. Also, believe it or not 17. 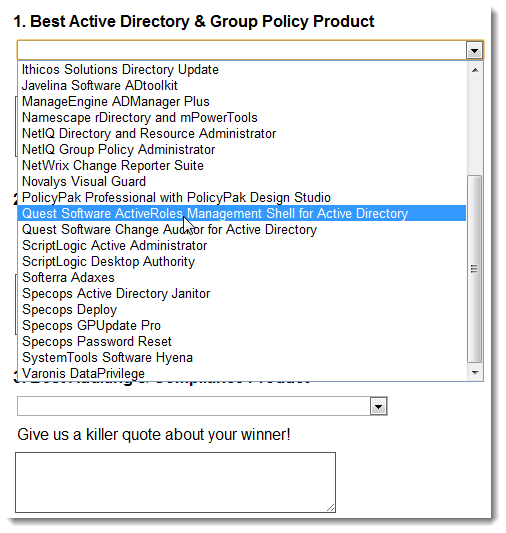 Best Microsoft Product has PowerShell as one of the options. 6. And obviously feel free to either ignore all other categories or cast your vote there as well. Cast your vote now – before the contest is over. Security MVP Vadims Podans just did a great post on using PowerShell to remove expired user certificates from Active Directory. Over time these increasingly clutter your AD, making administration more difficult and negatively affecting AD replication traffic. Luckily, cleaning up expired certificates with PowerShell is extremely easy. See Vadim’s original post for details. Read more about PKI management with PowerShell here. 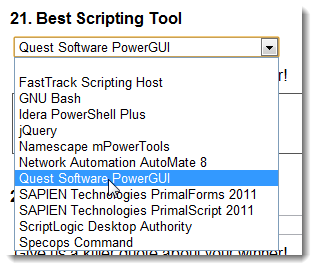 Script compilation to executable files is one of the features we have added in PowerGUI Pro 3.0. You would likely want to use compile a script when you want to share it in the enterprise environment and you are not sure whether the other person is comfortable running scripts or you simply don’t want risking someone modifying the code. Add other PowerShell scripts to the exe (if you have script which your main script is using). param ($MyParam1, $MyParam2) "MyParam1: $MyParam1""MyParam2: $MyParam2"
c:\Generated.exe -Arguments -MyParam2 "Value2" -MyParam1 "Value1"
To try this feature, you can install a trial version of PowerGUI Pro from here.